"Turkey left-over is now an endangered species" said our beloved local weatherman on KSDK Channel 5, Chester Lampkin. Maybe that's the case in most households, but not in ours. You see as soon as our Thanksgiving dinner ensemble were washed and tucked back in the upper shelf of our cupboard, I divided my turkey left-overs in small storage containers and kept them in the freezer. So instead of living out the weekend with endless left-overs and suffer the unequivocal turkey coma syndrome, I just grab a container whenever we feel like it. With the temperature down to the 20's and with some sniffles to cure, I grabbed one container in the freezer and magically transformed it to a wonderful bowl of comforting Arroz Caldo. The steam from the ginger lent some homeopathic remedies to the sniffles. Heat pan. Saute garlic until light brown. Add onions and ginger. Add the turkey slices and bones. (Use chicken in lieu of Turkey). Add the rice and give it a quick stir. Add 5 cups of chicken stock and a dash of safflower. Cook for about 30 minutes (if using lefovers and 1 hour if using raw meat). Cook longer if desired. You want the rice to be soft and mushy. Add chicken stock as you go. This is why I like Thanksgiving holiday especially for us Filipinos because turkey is really not part of tradition. I get to take home leftover turkeys from relatives (not ours, haha) to be cooked for something else. This is a great idea, Malou. I never thought of making lugaw out of turkey. Thank you and I hope you guys had a great Thanksgiving holiday. Yes we had a wonderful Thanksgiving. I had to expand my culinary celebration for the bird because we still have a lot haha! I also made binaggonang rice (my previous post or 2 posts ago) and yep, I had to be creative in hiding the turkey, otherwise, turkey coma it is haha! thanks for coming over. Let me hop over to your side to check what's cooking! 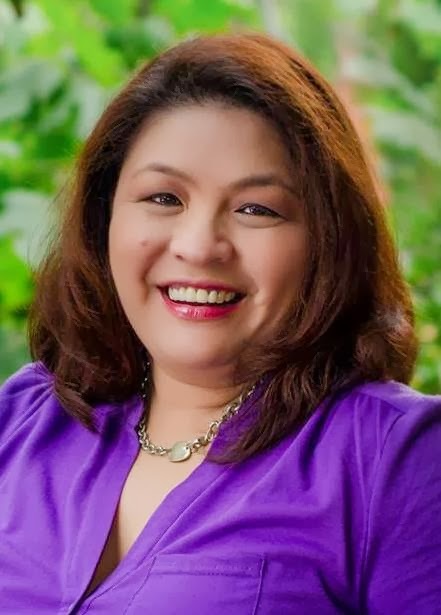 Hi Malou, I like your medical undertone in this post! :) Honestly, I did try cooking arroz caldo only once. But yours is so tempting!!! Did you put the chicken stock and rice together at once or did you wait for the chicken to boil first before adding the rice? I would like to give this a try this weekend. I usually put the uncooked rice first then pour the water. There was a time though that I used cooked rice (for shorter time of cooking) and it worked perfectly well. Oh you beat me to this post :) Yours looks absolutely gorgeous (lol so ignore my photos when you see Thursday's post). Never thought to use a garlic/annatto oil, I'll try that next time. You are silly! but of course I will still check it tomorrow. 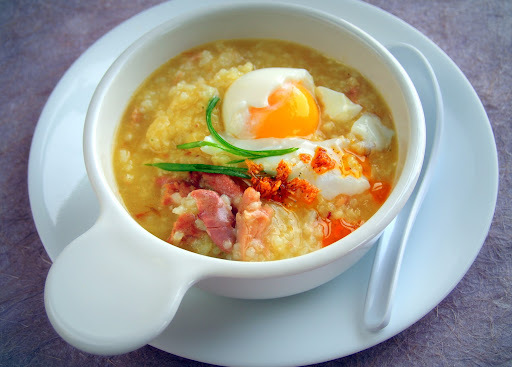 What matters is the comfort we get from cooking and eating a bowl of arroz caldo! What a delish way to make use of turkey leftovers. We always think the same thoughts when it comes to dishes, Malou. I just did the same with our turkey the day after. There's nothing like the warm comfort of a bowl of Arroz Caldo for this holiday season. Thanks for sharing! Hi BettyANN, I hope your thanksgiving went great.. i'm sure you had tons of fun with your family. Yep comfort food is what we need when the temperatures start to go down. 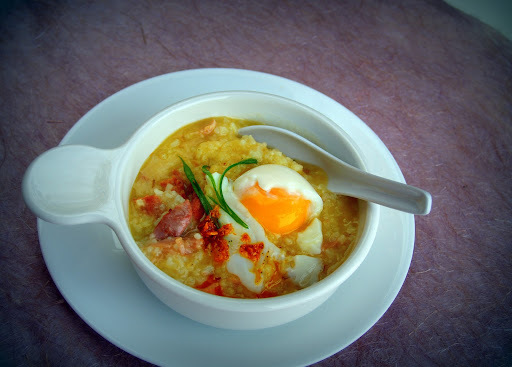 Wow, today is an arroz caldo kind of weather! My son is a huge fan of this Filipino comfort food, so I might just surprise him! Thanks! Sounds like you had a wonderful Thanksgiving, Malou! This year I left all the leftovers, and bones by my daughter for her to re-create something with it! Last year, I made a huge batch of turkey stock, and froze it in containers, to use for other dishes! Absolutely beautiful and creative Rice Porridge Soup; love the poached egg in the center...yumm!